The storm that we have been dealing with yesterday is on its way out with just a few wraparound snow showers. Any falling snow will end by around 7 this morning with the Midcoast hanging on to the flakes the longest. However, even as skies clear and the snow moves out, we must still contend with its impacts. As it intensifies, it will pull in a large volume of cold air in behind it which will do a few things. First off, it will make it very, very cold. Combined with the winds needed to transport all this cold in, today will feel absolurely frigid. As a result of low temps and powerful winds, gusting over 30mph at times, the NWS has issued a wind chill advisory for the mountains so bundle up if you must go outside. The second, and maybe the more important lasting impact will be to set the stage for our next storm, moving in Sunday night. By the time snow gets ready to arrive, temps will be below 0 for many areas with temps going down to 10 below in the mountains. With such deep dry, cold air in place, when the moisture arrives, the snow ratio goes into the clouds. Snow ratios across MA, CT, and RI will be in the 12-15:1 range meaning for every 1″ of liquid, 12 to 15″ of snow falls. Up here in Maine, we’re looking at ratios of 20-25:1. Needless to say, that is very fluffy snow, so even though we probably won’t get a lot of liquid, snow totals could be decently high just from the ‘fluff factor’. I’ll have another update with more maps this evening. Today will be a snowy one as the second sizeable storm this week intensifies offshore. Before I get flooded with complaints about more snow, the jackpot area of Downeast Maine will get over a foot, so by comparison, we’ve dodged a bullet. Snow has already started with light bands working their way across the region now in association with phase one of the storm – the clipper. Phase 2 is developing south of Long Island and will be our ocean low which will be rapidly intensifying as it moves NE. Phase 2, and heavier snow, arrives this afternoon into this evening. Models have shifted our total liquid down pretty dramatically overnight, which is worrying however it is a pretty last minute thing but one to mention nonetheless. 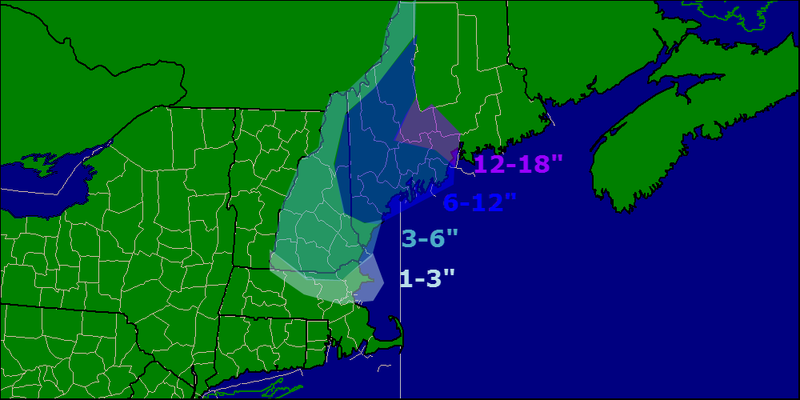 Total snowfall amounts will be mainy in the 6-10″ range across Maine with lesser amounts SW of there. Most of the snow will fall this afternoon through very early tomorrow morning. Just a heads up, snow totals across SW ME may end up a little on the lower side of the accumulation range. Snow winds down late tonight and finally departs before dawn tomorrow morning. Looking ahead, Monday’s storm looks like it will pass far enough offshore to bring little impact however there is time for that to change. Today will be a very quiet day weather wise as we get another ‘calm before the storm’ before our next one moves in. Expect increasing clouds and temps in the 10’s and 20’s with lightening NW winds. Some snow will begin to move in by later in the evening as our next storm approaches. I’ll have more details on that this evening. Today will feature clearing skies along with continued blowing/drifting snow as NW winds transport colder air in. Full details in my WMW report this morning. Quick mid-storm update this morning and all systems are go as far as the forecast is concerned. Heavy mesoscale bands are producing intense snowfall rates of 2-4″ per hour and storm to sometimes hurricane force wind gusts (50-80 MPH) are blowing all that snow around. Yesterday’s maps and analysis still stands so refer back to last night’s blog post for those details. Here is a look at the radar as of 10:00 this morning showing several areas of enhanced snowfall. 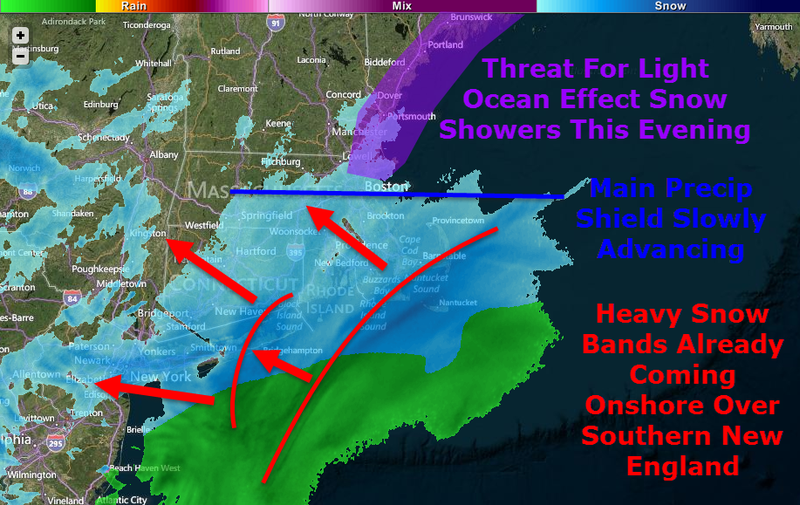 Our next intense band is strengthening offshore and will bring more intense snowfall rates to the area this afternoon. Even in areas outside of the heaviest bands, snowfall rates are still in the 1-2″ per hour range. Expect continued blizzard conditions through the afternoon and evening before snow becomes lighter tonight. Steady snow will end tomorrow morning before tapering off to snow showers. Colder air will arrive on NW winds tomorrow so expect continued blowing and drifting which could cause locally reduced visibilities and dangerous road conditions even though snow will no longer be falling. Our next chance for widespread snowfall arrives Friday but it should not be a major event. More details once this storm ends. Yet another storm threat arrives early next week. I’ll be back tomorrow morning with the usual AM update. It’s here, go time, T-0. Heavy snow is already moving onshore across southern New England as light ocean effect snow showers organize across coastal Maine and New Hampshire. The main precip shield, as of 5:30, is located just north of Boston extending almost due west and is slowly moving north. While I try to keep things under control in the technicality department, some higher level terms will be thrown around. Any words that show up in green, signaling a link, will take you to the glossary I have compiled with more information. Suggestions are welcome regarding terms you would like to see added to the glossary. A busy water vapor satellite image shows well the components of our storm coming together. 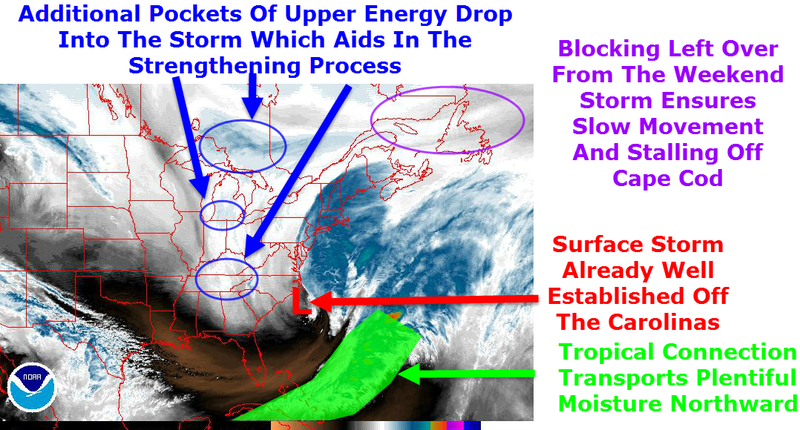 This is really a textbook storm with high latitude blocking, a strengthening low at all levels of the atmosphere, a deep tropical connection, and more reserve energy waiting to drop into the storm up in the Great Lakes. The storm’s strong baroclinic leaf consists of the broad blue area from Maine to Maryland and offshore. Just how many and how far-reaching will the impacts from this storm be? Hint: there are quite a few and they will cover all the bases. Lots of snow is expected with this one, no doubt about it. Widespread 1-2′ amounts are expected with slightly less in the far north and along the cape while areas west of Boston stand the greatest chance for over 2′ to as much as 3′ of snow. There are a few reasons for such high snowfall totals, first, this will be a rapidly strengthening storm. pressure is already falling fast off the Carolina coast and the low is quickly gaining steam. When you have a rapidly intensifying storm, you get intense upward motion on the NW side which brings very heavy snow. 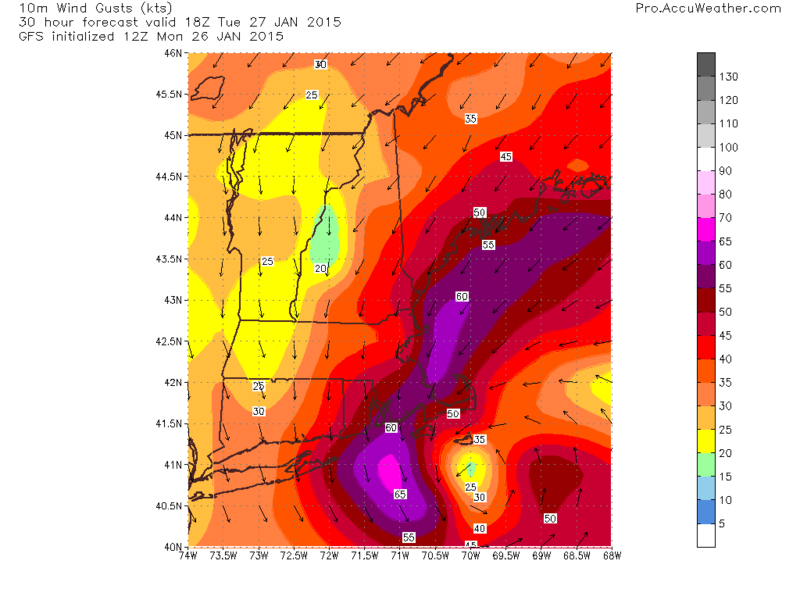 This map is the NAM vertical velocity map for 7AM tomorrow showing an intense band of snow along coastal Maine. 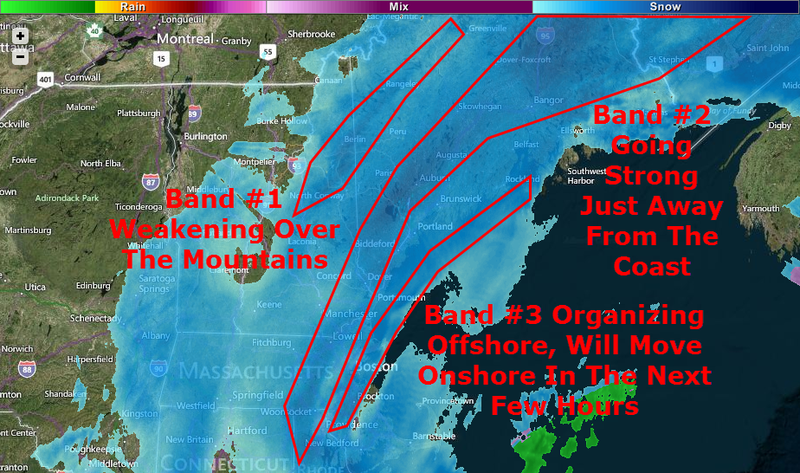 This band will later move inland bringing heavy snow all the way to Canada. In areas highlighted in pink, extreme snowfall rates on the order of 1-3″ per hour will be widespread along with enhanced winds along with the potential for thundersnow. Image courtesy, Accuweather. Another reason for high snowfall totals will be the dry, fluffy nature of the snow which can accumulate very efficiently. Temps in the single digits to low teens will keep snow dry and powdery for the duration as well as keep the threat for mixing well to the south and east. One last contributing factor to mention is the fact that the storm will stall out southeast of Nantucket for about 12 hours tomorrow and will keep rotating heavy bands onshore through the entire day rather than skirting right out to sea. With many hours of heavy, efficiently accumulating snowfall, amounts will approach or even exceed 2 feet in many areas. With a rapidly intensifying low to our SE and a strong, stubborn high to our NW, the pressure gradient will be extremely tight. Wind gusts exceeding 60 mph are likely along all of coastal ME and NH extending all the way through Eastern MA, RI, and Eastern CT. Coastal SE MA will likely see wind gusts over hurricane force Tuesday morning. Inland areas will see wind too, though less violent than coastal areas. Gusts exceeding 35mph will be common region-wide. Winds this strong, no matter the circumstance, will bring down tree limbs and power lines so power outages are a very real threat across coastal areas. The power outage threat will extend inland though will be mitigated somewhat by friction and thus lower wind speeds. The combination of high winds and powdery snow will cause extended whiteouts across coastal areas on Tuesday. 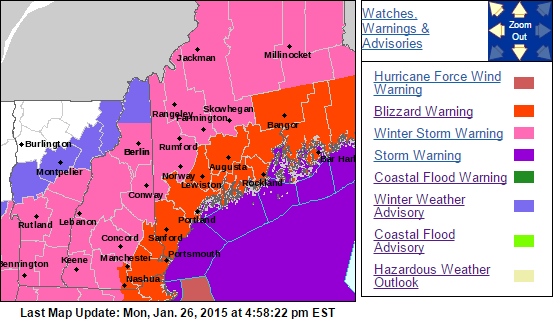 For this reason, the NWS has issued Blizzard Warnings for the coast as well as adjacent inland areas. To qualify as a blizzard, a storm must produce falling or blowing snow combined with winds of over 35 mph reducing visibilities to 1/4 mile or less. All these criteria must be met for 3 hours or more to qualify. All areas should expect scattered blizzard conditions but the coast is likely to meet the official criteria for a blizzard event. With such high amounts of snow forecasted combined with high winds, drifting will also become a legitimate concern especially for those areas in the blizzard warning. Drifts up to 4 feet are possible in some highly localized areas with other spots seeing bare ground as the snow is blown somewhere else. A prolonged period of strong onshore winds almost always results in coastal flooding and this time is no different. 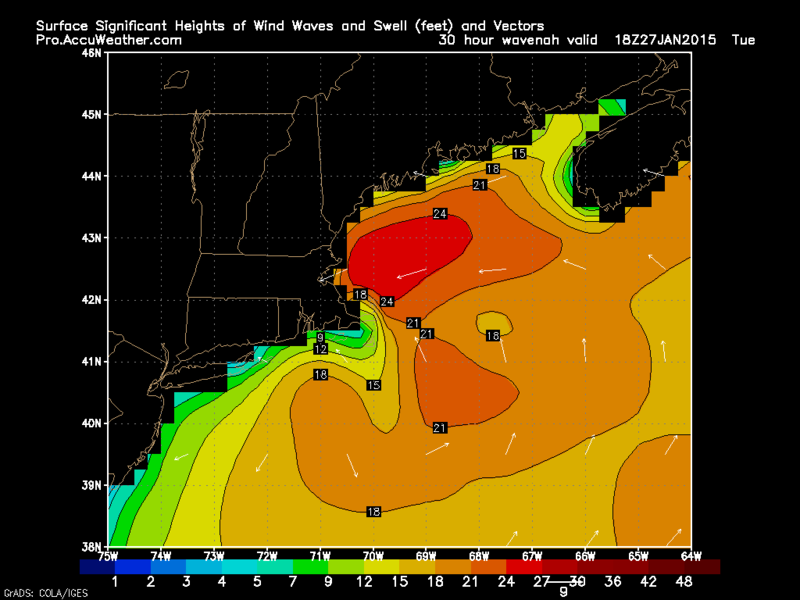 The map above is off the Wave Watch III model, courtesy of Accuweather, which shows 24 foot seas just offshore. While the more northerly component of the storm will mitigate the threat somewhat, the coast will take a bit of a beating for sure. For these reasons, the NWS has issued a Coastal Flood Warning for the entire coast which I totally agree with due to the expected 1-4 foot storm surge plus the strong wave action. Expect moderate to, in some places major coastal flooding with the high tides on Tuesday. Things will settle down somewhat Wednesday though some residual wave action may cause some minor problems. Below I will break down the timing along with travel impacts. The scale for travel impacts goes Minor, Moderate, Major, Severe, Extreme, Extreme Do Not Travel. If you must travel, always consult the latest NWS information. Tonight – Snow builds in from South to North becoming heavy at times later on tonight. Travel impacts: Moderate. Tomorrow Morning – Very heavy snow bands rotate in off the ocean causing extremely heavy snow which, combined with high winds, will cause travel to become impossible. Travel impacts: Extreme. Do Not Travel. Tomorrow Afternoon – Heavy snow sticks around though the extreme snow moves out. Winds will still be whipping causing continued whiteout conditions. Travel impacts: Extreme. Wednesday Afternoon: Steady snow moves out leaving patchy snow showers/squalls. Winds however will keep the threat for blowing and drifting snow around long after the flakes stop falling. Travel impacts: Moderate. Wednesday Night: Clearing begins, some blowing/drifting still possible mainly in the evening as winds continue to let up. Travel impacts; Minor. 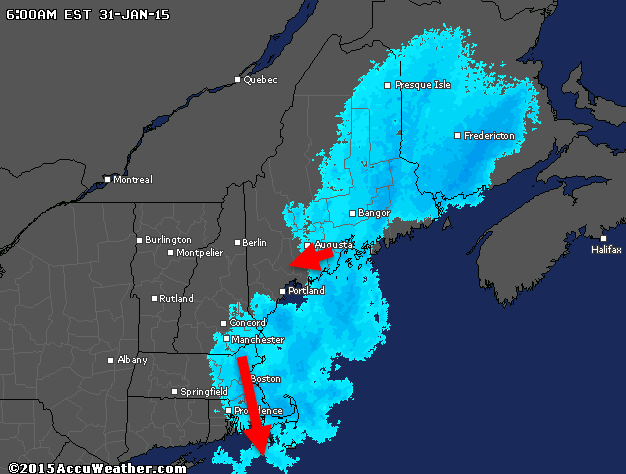 All in all, this will be a big storm, but probably not record-breaking at least for Maine. 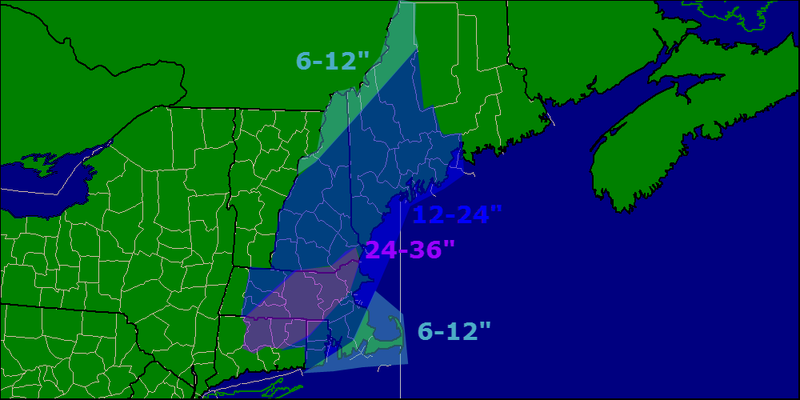 Widespread 1-2′ amounts are likely with the bullseye for 2’+ being west of Boston. Highs winds will whip the snow into a frenzy and cause blowing and drifting along with whiteout conditions. The peak of the storm will be Tuesday, especially in the morning. Snow slowly winds down Tuesday night before ending midday Wednesday. I’ll be back tomorrow morning with another update. Today will be a calm and cool day as clouds begin to organize ahead of the storm. For full details on today’s forecast as well as an update on the storm, follow the link to my update over at Western Maine Weather. I’ll be back this evening with another full update on the storm.